In 1948 African-Americans made up 9% of the total U.S. population, an historically low figure, but in other ways their ratings were far higher. To start with the mortality rate was considerably higher, with whites expected to live to nearly 63 years of age while blacks on average would reach just 52. Of course the incarceration rate was also higher as nearly 30% of those imprisoned were African-American. The income disparity was high as well, as blacks earned only 60% as much as white workers. In 1948 racial segregation was legal in America, still enforceable by Plessy v. Ferguson, though in the south it was also enforced with widespread state sponsored terrorism and murder. In order to continue to allow such actions without fear of reprimand southern Senators continually blocked anti-lynching legislation in Congress and to date only one man (in 1946) had ever been convicted of a federal crime for the lynching of a black citizen! His sentence was just one year in prison and a thousand dollar fine for civil rights violations. Rock ‘n’ roll music, among the most massively influential cultural inventions of black America, was only just getting started as 1948 dawned but already they were envisioning a brighter future. Reality vs. optimism can be a tricky road to navigate. Everybody, no matter their race, color or creed, all want the same basic things out of life. Freedom. Security. Fairness. When those who have it and dispense it also withhold it from those who don’t the reality is a far harsher world with lowered expectations and no belief in justice. For older Americans of African descent who’d spent a lifetime watching their rights be systematically trampled by the country they called home, optimism seemed but a cruel hoax. But for those just coming of age, those who’d seen their status improve over the course of their more brief time on earth with expanding job opportunities brought about by World War Two which resulted in a mass exodus from the oppressive southern cultural climate, and subsequently the increased earning potential and freedoms that went with those moves, there was suddenly reason for that optimism. Black America had begun to assertively demand their rights in the previous few years and 1941 saw the first federal intercession on behalf of civil rights since reconstruction with the creation of the Fair Employment Practices Committee. In truth the committee had no power other than persuasion but its mere creation was proof that black lives, black votes and black pressure increasingly mattered in America. The breakthrough quickly led to more advances that just a generation before would’ve seemed all but impossible to envision. The Congress Of Racial Equality was formed by students in 1942 and were the first to successfully use coordinated tactics of non-violent protest to push for – and achieve – integration… Courts struck down the right of political parties to hold all-white primaries in 1944, thereby providing the first crack in the widespread political disenfranchisement of black Americans… In 1946 the Supreme Court outlawed racial segregation on interstate transportation and the following year organizers set out to test the complicity of that decision on The Journey Of Reconciliation. When its participants were jailed and sentenced to a chain gang in North Carolina the public attention of the event brought about an end to that form of harsh punishment in the state… At the end of 1946 President Truman signed a legislative order creating a committee on Civil Rights and in 1947 America’s national pastime was integrated as Jackie Robinson became the first black to play Major League Baseball and quickly proved himself to be far better than most whites in the game. Small incremental steps maybe, but steps towards something more profound all the same. Realistically the inequality in 1948 was still overwhelming. Optimistically there was every reason to believe that true equality was closer to being achieved at last. Which view you saw in front of you was largely determined by your perspective. Rock ‘n’ roll music was born out of those who held that optimistic outlook. Cultural movements have always reflected the mood of the community it’s intended for, if only to match the expectations and needs of their audience, and rock ‘n’ roll was no different in that regard. It was just recently that World War Two had seen songs of sentimental longing dominate popular music which captured the feelings of the country at large, and then, as if on cue, post-war mainstream pop returned to more lighthearted fare now that the fighting was over and the world returned to normal. In both cases the music reflected the mood of the populace as a whole. Now by 1948 rock music was emerging to express the point of view of an entirely different constituency, one starting far lower on the scales of justice but consequently one with even more to look forward to if the world was indeed changing for the better. 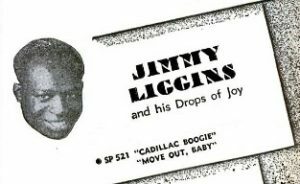 Nowhere in rock music was this feeling epitomized more at the time than by Jimmy Liggins who with one monumental record encapsulated the optimistic mood of the young and ambitious post-war black American culture. The horns kick off this generational call to arms with irrepressible joy as Cadillac Boogie perfectly captures the forward momentum of both rock music itself and the progress being felt all around the black community. It’s a song celebrating achievement and to that end he’s bragging about the very symbol of success in America – the owning of a Cadillac – where the mere possession of it coveys importance. This was a universally recognized sign to one and all that you had made it and achieved the American dream and so it’s perversely appropriate that he’s using a car that was previously out of the realm of possibility for even the most sanguine black dreamer to announce this new worldview. As the song’s horns give way to Liggins, all of twenty-five years old, he proudly and defiantly insists that this dream is not just possible, but inevitable. In fact, he’s shouting out the windows as he cruises by, encouraging the neighbors to go out and GET what you want… what you’ve earned, dammit! His declarative baritone never lets up. The horns churn behind him relentlessly, the song being propelled as much by the spirit of the performance as by the specifics of the arrangement. The fuel they’re powering this with is the growing belief that urged one and all not to simply sit back and wait patiently for someone to toss you some scraps and then expect you to be grateful for their charity, but instead to believe that it is your RIGHT, every bit as much as theirs, to strive for that stature in the world and when you do seize it to be proud of it! Of course that’s not ALL this song is notable for. Musically it was also a portend of the future. Although for years it was barely acknowledged, or simply passed off as a fairly insignificant historical curioso, the song was later appropriated for another record that in the years since has had a methodical campaign to pass IT off as the hallowed “first rock record” ™. 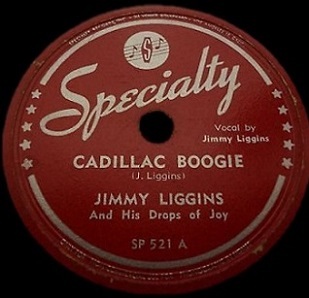 But for those still clinging to that self-serving claim by Sam Phillips and the many who fell under his legendarily hypnotic spell there can be no plausible denial that Cadillac Boogie is simply Rocket 88 in its original form. Oh there are differences, starting with the horns rather than distorted guitar carrying much of the instrumental thrust, and a few lyrics get changed along the way, but the melody, rhythmic drive, even the vocal tone of both Jackie Brenston and Jimmy Liggins (neither one a great singer) are all but identical. What’s MOST different ironically is the theme. Rocket 88 (still a great and important record, make no mistake about it) is, probably not surprisingly, fit with a storyline more suited for the white historians and musical crate diggers who posthumously elevated it to its current level of acclaim and widespread adulation. Rock has been affixed with the image of rebellion from the start, it’s one of the music’s more publicized features after all, and so a song about a drunken joy ride I’m sure seems like quite the flaunting of authority and societal conventions by the sheltered frat boy mindset of those who generally write about rock history and who never struggled with any kind of widespread discrimination to relate to its importance. But if rebellion and insurrection is what you’re after, what could MORE rebellious than Jimmy Liggins brashly giving the finger to the systematic oppression leveled against rock’s entire intended audience by the world’s biggest superpower? Rock ‘n’ roll, we keep reminding everyone, was and is the sound of freedom. Yes, I admit that for most listeners over the years the freedoms which rock represents are admittedly of the small variety, though they may not seem small when you’re 14 and feel you’re under the tyranny of parents, teachers and other guardians of fun that exist beyond the walls in which you’re confined, but even those kids know full well that those freedoms they seek are inevitable in time and so rock ‘n’ roll is merely the anticipatory fanfare that accompanies its eventual arrival. But that wasn’t always the case. Rock’s birth gave voice to freedoms its audience had been told by society not to believe in. But belief itself can’t be forcibly denied and for those who allowed themselves to believe that the roads ahead were going to welcome them rock ‘n’ roll was the music the cars they sped along in would be playing – loudly, defiantly, proudly. The possibilities suddenly seemed endless. The world had changed. The war had far-reaching effects into every aspect of life, from travel and production to housing and education. It wasn’t at all unreasonable to think that this would soon extend to those too often excluded from the table by virtue of race. The post-war years were when the country’s optimism, technological advances and innovations were all spiraling upwards. Though still limited there were signs of progress being made even for those long on the outside looking in and as fitting for a land of luxury evidence of this optimism manifests itself in boasts of achievement signaling a growing equality, which in a consumer society can best be seen through buying power – what you have I can get too. It was an eventful time all around, one of great promise and nowhere was that more apparent than in the growing excitement of rock ‘n’ roll. A still nascent development known to only those in a small often neglected segment of society, but one which saw – and most importantly now celebrated – brighter horizons in the future. Cadillac Boogie may not be specifically about any of that, but its spirit permeates the recording all the same. This record not only signaled what was around the corner musically, as evidenced by Ike Turner and Brenston hijacking it and taking it for a joy ride three years later, but also culturally for the people who could finally envision themselves behind the wheel at last. That road itself unfortunately would be a much rougher one to travel than the musical one, but at least the highway was now open for traffic and more and more were determined to be barreling down that road in STYLE. See what you think. Maybe those entries are wrong for all I know, but I thought I’d check with you. I wish you all the time in the world to complete the narrative! Thank you for the kind words and I’m glad you’re enjoying the site. Stick around and keep commenting, the more conversation there is from visitors the better the site becomes. As for the release dates, I use both of those sites you mentioned as starting points at times but I’ve found each tends to use the dates they were reviewed in Billboard or Cash Box as the release dates. Since both of those magazines during that era had a large lag time when it came to reviewing indie records, usually between one to three months, I take that into account, then try and cross-check using other sources. But I definitely appreciate the heads up and am glad others are as concerned with getting the right dates as I try to be. One good thing about the site – as opposed to books – is I can always edit the reviews at any time to reflect updated information and even re-sequence the reviews accordingly so they’re in the right slot. 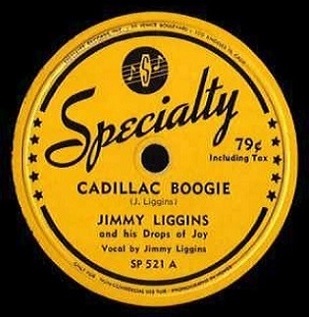 Leave a reply on "Jimmy Liggins: “Cadillac Boogie”"